When we’re talking about someone’s personality type in the Myers-Briggs system, we usually talk about their primary and secondary functions (also called mental processes). 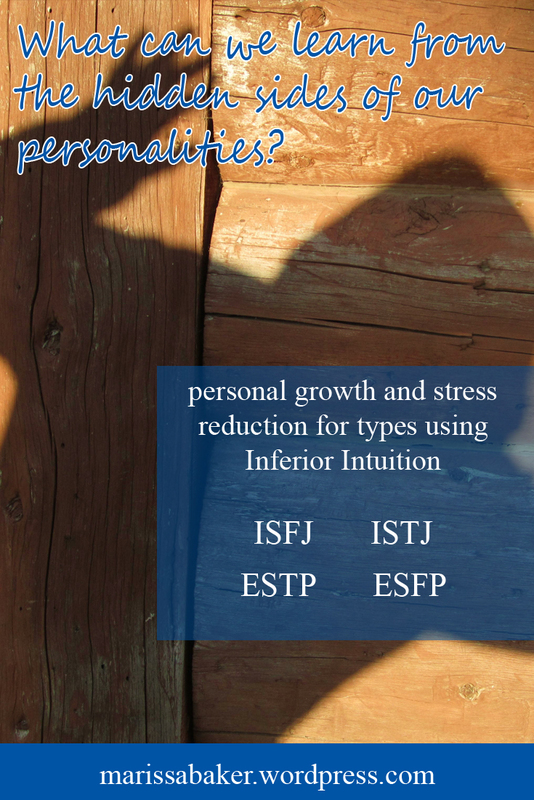 An ISFJ, for example, leads with a process called Introverted Sensing (a perceiving/learning function), which is supported with Extroverted Feeling (a judging/decision making function). An ESTP, on the other hand, leads with Extroverted Sensing, supported by Introverted Thinking. Using Personality Hacker’s car model,* we can compare our primary function to an adult driving a car, and the secondary function to a second adult navigating in the passenger seat. Each type also has a tertiary function (the opposite of their secondary function), and an inferior function (the opposite of their primary function). These are less well developed. In the car model, our tertiary function is like a 10-year-old sitting behind the co-pilot, and the inferior function is like a 3-year-old sitting behind the driver. The processes you use most readily are the ones typically visible, and they define your personality as others usually see it. Our less developed functions play a significant role as well, though. Today, we’ll be looking at types which use Intuition as an inferior function. ISFJs and ISTJs also lead with a sensing function. They primarily use Introverted Sensing, so that makes Extroverted Intuition their stress function. Here are the traits Quenk associates with inferior Extroverted Intuition (and their counterparts in Ne-dominant types like ENTPs and ENFPs). 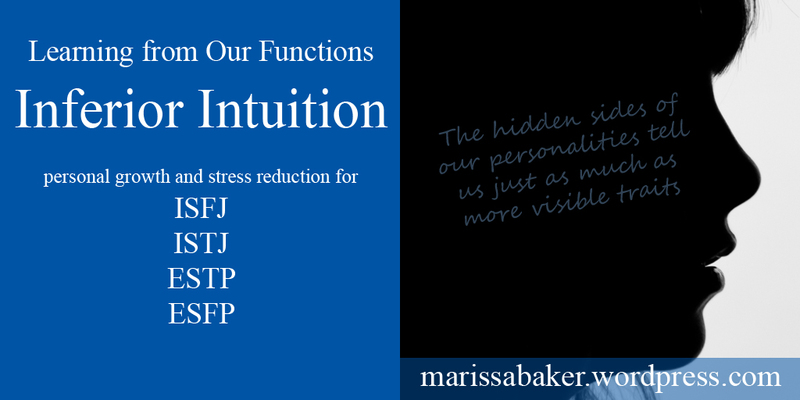 There are similarities in how a dominant Intuitive type and an inferior Intuitive type use their intuitive functions, but intuition in ESFPs, ESTPs, ISFJs, and ISTJs is poorly developed. For most types, the inferior function isn’t always visible. In ISFJs and ISTJs, though, it “seems to color the everyday personality” and they are typically seen as worriers (Quenk, Was That Really Me?, 215). It’s not all bad, though. When an Introverted Sensing type enjoys creative pursuits like writing poetry or music and creating a work of art (especially arts in an abstract form), they are tapping into their intuitive side. They might also daydream or enjoy escaping reality via fantasy and sci-fi. An interest in spirituality — especially aspects of God that cannot be understood with the five senses — might also be tied to the intuitive side. Worries related to inferior Intuition frequently show up in ESFPs and ESTPs, who are often challenged by society for their apparent lack of seriousness. They rarely stay worried for long, though. Like the introverts, Extroverted Sensing types might also be avid readers, enjoy the arts, and can be attracted the spiritual or metaphysical as a way of explaining their intuition. Most of us don’t use our inferior processes on a regular basis. We’re so used to using the better-developed processes that we don’t spend much time worrying about the ones we don’t use. But under certain stressful conditions, we lose touch with our primary and secondary mental processes and fall-back on the undeveloped inferior function. Think back to the car model we mentioned, and imagine that something unexpected happened (like you swerve to avoid hitting a construction cone or small animal). It shakes up the passengers, the 3-year-old starts crying and suddenly the only thing anyone in the car can focus on is calming the baby. Unknowns and future plans can trigger stress in all types that use dominant Sensing. ESTPs and ESFPs are most sensitive to situations and people that want them to make a commitment or think about what the future holds. They don’t like feeling trapped by planning, or being judged by people who are more serious and goal-oriented (Quenk 174). ISFJs and ISTJs experience anxiety about “the prospect of unknown, previously unexperienced activities” (Quenk, 218) They also hate it when someone contradicts evidence they can see with their eyes (e.g. they’re having a particularly bad day and someone tells them everything will be fine). When Sensing types are “in the grip” of inferior Intuition (to borrow a term from Naomi Quenk), they display the characteristics associated with inferior Introverted Intuition or Extroverted Intuition. They are more likely to feel panicked, confused, and as if they’ve lost control over their lives. Intuition is great at coming up with future possibilities, but for dominant Sensing types the possibilities coming out of inferior Intuition often look terrifying. They’ll be distracted by worst-case-scenarios, and may seem paranoid. Instead of processing sensory information with their typical speed and accuracy before acting, they’ll second-guess everything and without careful thought. Once we know what our inferior function is an how it affects us, we can start to learn from this hidden side of our personalities. Just knowing it’s there is reassuring, since now we have an idea of why we react to stress the way we do. It also opens up tools for understanding how our minds work, getting back to “normal” after we’ve gone through a stressful situation, and learning to use our inferior function effectively. ESFPs and ESTPs frequently experience “inferior function episodes,” but they rarely last long. Their brains work quickly, and they don’t tend to dwell on things. If you are an ESFP or ESTP trying to get out of a stress-reaction, it often helps to have a contingency plan that you can fall-back on but still feel free to change. Talking it over with someone works for many ESFPs and ESTPs (both men and women), especially if they encourage you to reconnect with reality and find logical explanations for what’s troubling you. Others Extroverted Sensing types find that working through the experience and doing some hands-on activities also grounds them in their Sensing function (Quenk, 184-185). As introverts, ISFJs and ISTJs need more alone-time to process the eruption of their inferior function. They might use this alone time to analyze and re-frame the situation to solve the original problem or plan how they can react better next time. Most people with these two types say physical exercise is one of the best ways for them to return to normal. The exception is female ISFJs, who rarely list exercise as useful. Female ISFJs are also more likely to want to talk about their stress reaction with someone else after they’ve had a chance to think (Quenk, 231-232). Most type theorists will say people rarely start to incorporate their inferior function until mid-life, but you can start learning to use your Intuition any time. Isabel Meyer suggested that every type exercise all four of their functions when making a decision. Your dominant Sensing helps with analyzing facts, facing reality, and understanding exactly what sort of situation you’re facing. Tapping into Intuition (instead of being scared of it) allows for discovering possibilities you might not have otherwise considered, like how you might change the approach and attitudes that you and others bring to this particular situation (Meyers, Gifts Differing *, 197). As they learn to incorporate Intuition more fully, ISFJs and ISTJs seem to “mellow” and become more relaxed toward shortcomings in themselves and other people. They’re also less stressed by unexpected events (Quenk, 233-234). 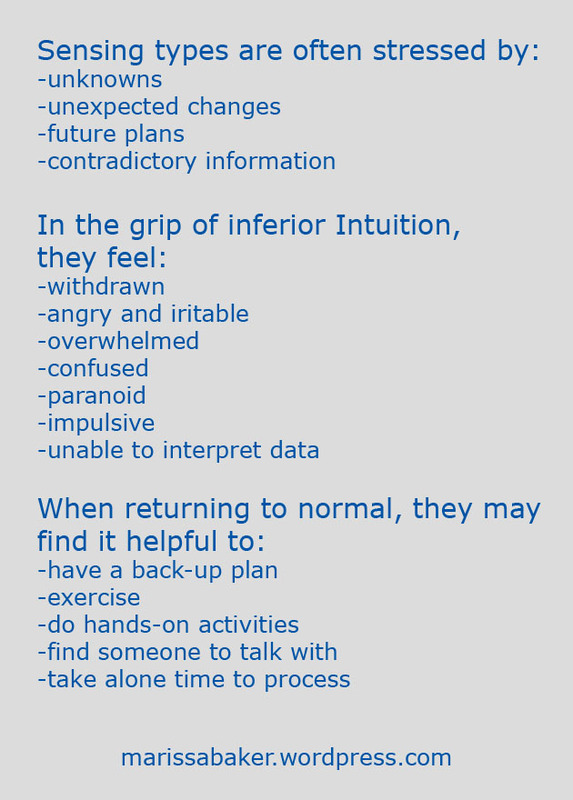 ESTPs and ESFPs who use their intuition more fully start to seem (a little) more mature. They also feel more comfortable and secure in themselves (Quenk, 186-187).